When we are physically healthy, strangers are to be kept at a distance. That’s why we lock our doors and are wary of people we don’t know—“Never, ever open the door to a stranger!” When illness enters our lives and the lives of those we love, however, something strange happens. The people we know most (or the people we thought we knew) find it difficult to enter our lives . . .
(1) Acceptance—Hospice volunteers willingly walk into our lives when some friends, acquaintances, and neighbors walk out of it. Why? Hospice volunteers didn’t know our loved ones before they were ill. Their role always begins with the onset of illness. They walk into our homes and our lives and see our loved ones for who they are—not who they used to be. Sometimes, those who know our loved ones best can’t get beyond comparing and contrasting who they were with who they are now. In the process, grief and shattered expectations can prevent them from seeing what is before them. Hospice volunteers openly accept the present. This pure acceptance of what is—rather than a concern over what was, what isn’t, what could have been, what should have been—means they orient themselves to our loved ones in drastically different ways than most others. They bring a radical kind of attention to our lives—attention preoccupied by what is rather than what isn’t. (2) Guilt and Agenda Free Care—Hospice volunteers don’t bring guilt with them. They don’t know our past. They don’t have broken promises and don’t bring with them past grievances that can sometimes get in the way of the time they spend with you. Sometimes, our closest family and friends disinvite themselves from the illness experience because they believe they’ve let us down. They said they would call over the weekend—but didn’t. Guilt then becomes a barrier between them and us. “It’s too late to call now. I should have called. 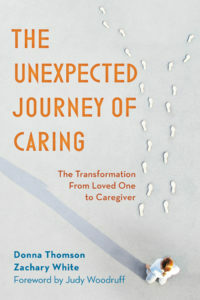 What would I say now.” Hospice volunteers don’t carry with them the baggage of interpersonal and familial obligation. Their role protects them from having to explain, rationalize or justify. They have no agendas. No desire to persuade you to do or be or say anything other than what you choose. Sometimes, for family and friends, guilt and unresolved issues get in the way of care visits—turning moments of peace into storms of internal doubt, regret, and confusion. (3) The Freedom to Be— It’s hard for us to separate words from care. If you care, you speak. If someone is in your presence, you must be a good host, and entertain them with words and conversation. For others, the premium on words seems to grow in importance as friends and family take the time, energy, and money to visit. When everyone is preoccupied with avoiding saying the wrong thing or being a good host—authenticity retreats. Awkwardness enters and dominates. Silence becomes a sign of a relationship gone wrong rather than a sign of comfort. Unlike family and friends, hospice volunteers know that what is said isn’t nearly as important as physical presence. Silence is not a sign of a failed connection, but a vital part of the vocabulary of care and comfort and assurance. You and your loved one don’t owe hospice volunteers your words. The permission to remain quiet in another’s company, knowing you are not alone, comforted by the peace of another, unburdened by the need to say anything at all, is a gift few others can provide. The hospice affect is hard to explain to outsiders. Sometimes, only in the company of strangers, can we feel free to be open and honest. Sometimes, freedom means not feeling the need to protect or withhold or edit ourselves for fear of how we will be (mis)interpreted. Sometimes, opening the door to trained hospice volunteers willing and able to enter our homes when it feels like everyone else has exited long ago, reminds us that we are still worthy of attention and connection. Something strangely beautiful can happen when we greet others who see us in the midst of living while dying. Thank you to those who knock on our doors when life is still being lived.